Having returned to the workforce full time now for three months - after 10 wonderful years at home with my 3 kids - I'm slowly finding time to sew again. Tuesday nights have turned into sewing nights with me sewing in the toy room, whilst the kids are playing and watching TV. It's a nice way to wind down after a busy day at work. 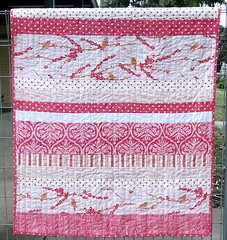 Last week I made a little quilt for a girl turning 10 years old, using mostly Joel Dewberry's Sparrow Collection fabrics and some of Tanya Whelan's Ava Rose fabrics.